Built around the desiccated remains of what appears to be a 1937 Plymouth sedan, this metallic hyena’s mission is to scrounge the wasteland looking for carrion to consume and repurpose. The spikes were not part of Plymouth’s original design. It’s a monster truck shoved under the sheetmetal of what appears to be a 1939 or 1940 Fargo pickup. And Fargo, for those scoring at home, was what many Dodge trucks were called when sold for export to (or built in) countries like Canada, Turkey, and, yes, Australia. Riding on 66-inch-tall Goodyear tires and featuring four feet of suspension travel, this beast, according to the official materials, is powered by a supercharged V-8 turning a Turbo 400 automatic transmission. The massive axles are reportedly from a military tanker. And the name of the character who drives this is “Rictus Erectus.” Giggle. Australian automotive history is filled with chapters that are both obscure and bizarre to American eyes. Case in point: the Perentti. Because the Corvette wasn’t exported to Aussie Land and was left-hand-drive-only, in the early 1970s, the maniacs at a Sydney-based company called Custom Performance Modification decided to plant a copy of the C3 Corvette’s fiberglass body atop the chassis of a Holden one-ton truck. But because the truck was 22 inches longer than the real Corvette and had a 120-inch wheelbase, the result was, well, strangely proportioned. It’s kind of awesome but truly wacky. For the moviemakers, however, a Corvette built on a big, rugged truck frame offers several advantages. So Buggy #9 was created as sort of a last-days-of-disco-era Vette running through misery while chewing on a fistful of meth. And it should be enough to leave many North American gearheads leaving theaters muttering to themselves in a bewildered haze of confusion. “Mack,” an R-series wrecker tasked with trailing the action and scavenging the battlefield for precious scrap and equipment. It’s an homage of sorts and its own beastly thing. In the mix-and-match world of classic Australian muscle, the 1971–78 Chrysler Valiant Charger is something of a companion to Ford’s XB Falcon that plays so prominently in the Mad Max mythology. 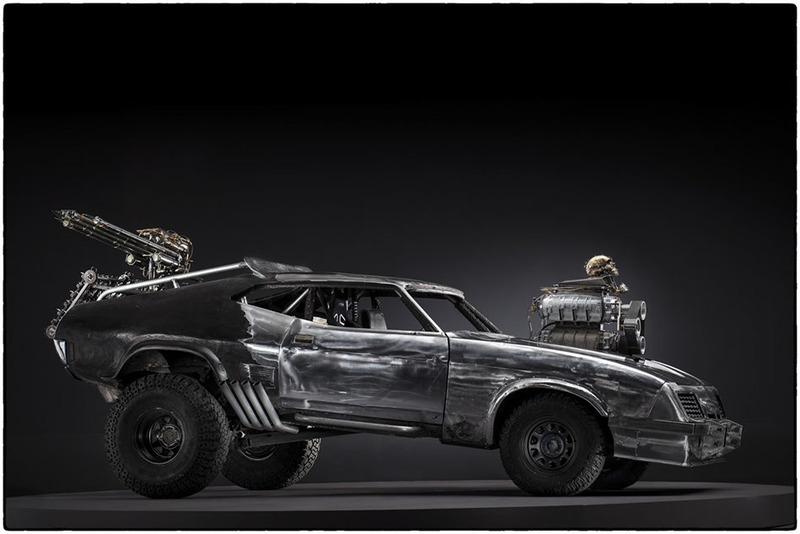 So in Fury Road there are at least two Valiant Chargers featured. This one, called Peacemaker, isn’t so much a Chrysler of any sort as it is some classic sheetmetal stretched out over a U.S.-made Ripsaw light-tank chassis. In the film, it’s piloted by a character called The Bullet Farmer and is used in several socially malevolent ways. FDK is this blown, V-8–powered contraption to which the filleted body of a Volkswagen Beetle is tack-welded. In the story it acts as part of a convoy guard that throws off flames with fuel from barrels integrated into its structure. "The War Rig" is a 78 foot 18 wheeler based on a Tatra T815, an all-wheel drive truck manufactured in Czech Republic. It has undergone heavy modification, however. The originally placed cab was moved from over the engine to the middle of the chassis.A custom front was fabricated and additional passenger space was added to the back of the cab, built from a widened 1947-48 Chevrolet Fleetmaster Sedan. Three "War Rigs" were created for the movie. All of the trucks were identical and used interchangeably. Two trucks survived filming. The cabin of the vehicle is a combination of the original Tatra T815 cabin with a widened rear half of a Chevy Fleetmaster. The front windshields have been modified along with doors that are rear-hinged (aka. suicide doors). There is a skeleton arm painted on the side of driver's door signifying that the vehicle belongs to Imperator Furiosa as she is missing her left arm. There is a custom removable steering wheel with a skull motiff. The accelerator is made of a foot measuring device and is capable of locking at full throttle. Inside the cabin there are approximately ten firearms placed within comfortable reach distance. The center console is littered with a variety of gauges and switches at the bottom. The top of the center console holds space for useful items and tools. The dashboard has a number of gauges and switches as well including revs for both engines, temperature and fuel gauges. Underneath there are hidden switches used for the start sequence. On top of the dashboard is the SKS sniper rifle on the passenger side and a 9mm magazine on the driver's side strategically mounted for one-armed reloading. The stick shift has a supercharger switch and a hidden dagger disguised as a bone gear stick knob. On the side of the driver's seat is the Cow Catcher lever decorated with an 8-ball. The passenger space in the Fleetmaster section is occupied by a makeshift rear seat built from two seats with improvised seatbelts made from rope. The doors have additional compartments built inside them. There is a custom sunroof built into the cabin and the roof itself is decorated with Immortan's skull motiff. The cabin has a built-in roll-cage. The War Rig was originally equipped with a stock Tatra engine. The original engine was air cooled with a massive turbine fan hidden behind a custom front grille. Unfortunately it was under-powered so to adequately haul heavy tankers it was replaced with a 600hp Deutz engine used in Dakar racing. Only the front engine powers the vehicle. There are two dummy (non functional) Holley superchargers protruding through the bonnet to give the appearance of being powered by two engines. Two pairs of exhaust stacks are installed, presumably one for each engine. The truck has a fully functional hydraulically operated plow moved by two Taesung TS2485 tractor attachment digger arms. "The War Rig" hauls a tanker and a fuel pod, both of which act as a platform for the War Boys to carry out attacks and defend the vehicle. The main tanker has two turrets, the rear one made of a chopped Volkswagen Type 1 (aka. VW Beetle). Both front and rear turrets are armed with harpoon guns. The rear turret has two swing arms that allow for War Boys to move around the tanker quickly and mount the pod. The fuel pod is armed with a harpoon gun and a flame thrower. The sides of the main tanker are protected by spikes and slanted sharp pieces of metal combined with circular saw blades that are running around the tanker. The main tanker is decorated with skulls and doll heads. Inside the main tanker is a hidden living quarters section accessable from underneath. The car driven by Nux is a Chevrolet 5 Window Coupe from 1934. Four "Nux" vehicles were built for the movie, two of them with fully finished hand-built interiors. The donor cars were stripped of all paint and for a brief time were covered in black pitch with an additional skull design on the door. Pitch was later abandoned and the vehicle was ground to bare metal, removing the skull design as well. The engine was replaced with a 350 Chevrolet V8. In the movie, it is connected to two turbochargers feeding into the supercharger. That setup was non functional. The vehicle was also equipped with a set of Cooper STT off-road tyres. The lower section of the door was cut and welded to the chassis shortening the door height, and angle the rear of the door up allowing them to open over the massive exhaust piping on both sides. The brake pedal has his name welded onto it, the steering wheel has a decorated doll's head representing the death and rebirth of the old world. In the front of the vehicle there is a cross to which an unfortunate victim can be strapped and used as a "blood bag" with IV tubing running through the chain from the victim to the driver, providing him with a steady stream of blood, often with a hefty dose of adrenaline. The Gigahorse is a custom vehicle driven by Immortan Joe. The vehicle is built from scratch with a powerful and sophisticated drivetrain and highly modified body. The car is built on a custom chassis, with a body made of two 1959 Cadillac Coupe de Villes sitting on top of each other. The bottom shell is widened and equipped with a custom windshield. The upper Cadillac is stock width but has been fabricated to function as a turret with a harpoon gun and a flamethrower in the back. To signify Immortan Joe's power and wealth both those guns have wooden finish. The front end is standard 1959 Cadillac equipped with a custom heavy duty plow. The Gigahorse is approximately 4 meters high without the flags and weighs in at 10.5 tonnes. It also appears to have bulletproof glass in the movie. The Gigahorse is powered by two Chevrolet 502Cid (502Hp) Big Block V8 crate motors with fabricated manifolds and functioning 8/71 superchargers. Both engines are connected through a custom gearbox. Anthony Natoli of Natoli Engineering designed the straight cut gear system joining the two engines. The gearbox adapter was then modeled by the movie's art director Jacinta Leong in AutoCAD, all the components were waterjet cut, assembled and originally connected to a Turbo 400 automatic transmission which was later replaced with Allison automatic truck transmission. The custom gearbox system had to be re-shimmed after each day of filming by film's main mechanic - Mark McKinley. The engine setup is fully functional generating approximately 1200 horse power. The vehicle also has a non functioning set of turbochargers with their rotors removed and feeding into superchargers. Originally the two engines were supposed to be dummy motors made of fiberglass with a single real engine hidden inside, but the production designer - Colin Gibson provided additional budget which allowed to equip the Gigahorse with an actual working engine setup. The vehicle is equipped with tractor tyres, the rear ones being 70" in diameter. The rims and hubs are custom made. The differential and reducer systems were taken from a pair of Terex four-wheel drive front-end loaders. The massive hubs gave a 16:1 drive ratio for a 95km/h top speed, but according to Collin Gibson The Gigahorse managed speeds up to 125km/h. A set of stacked superchargers, which are non functional in reality as they are mounted above the air cleaners, but both are belt driven by the engine. The two superchargers are 6v71 & 6v53, essentially the same as the original Interceptor. The scott injector hat is decorated with a skull with metal teeth. The bonnet had to be put over the superchargers from the top, then it was pinned to the car. The vehicle was lifted in the front and in the back, with Ford F-100 9-inch differential, and a set of "37 off road tires that fitted into a modified set of flares originally designed by Scott Smith. Additional bars in the back and under the doors were added. The Concorde front end was fabricated in metal with barbwire headlight covers.